Bilderberg 2.0: New Technocratic Construct In The Works? New generation of elites taking the transnational reins? As today’s groundbreaking revelations by Infowars will possibly reveal, Bilderberg is moving itself into a new hybrid leviathan, with Google as the new vehicle for policy implementation. A new generation has emerged, alligning itself with the good old boys at Bilderberg. Not that this newer generation has appeared out of thin air to rock the world of the old-timers. Far from it. The key players now taking the digital helm in this probable “Googleberg” construct are literally the offspring of the older players who are keenly aware that if the ancient agenda is to endure, a merger with the new guard needs to be established. One such key player who has presumably been offered the steering wheel in both policy setting- and operational activities, is the son of the former queen Beatrix of the Netherlands, Constantijn van Oranje-Nassau. As EU commissioner Neelie Kroes’ first man in her “digital agenda” cabinet, Constantijn is well placed to play a key role in securing the reigns in the hands of international bankers who make the final decisions. 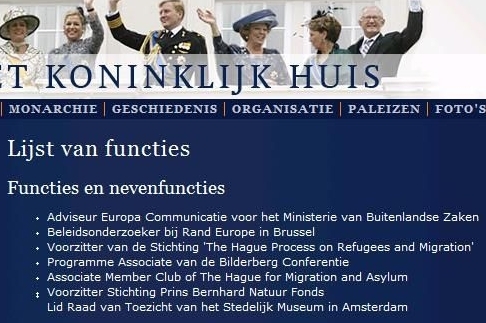 Constantijn was described as “programme associate” of the Bilderberg group on the official royal website back in 2009. Although the website scrubbed the mention shortly after I published this information on Infowars.com, the original cached page was salvaged thanks to vigilant observers in the alternative media. 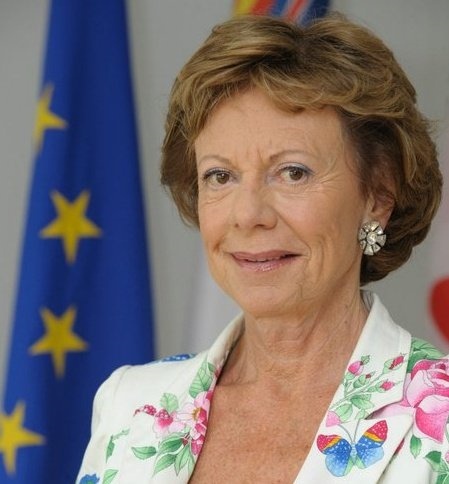 Constantijn’s benefactor in the world of global governance, Neelie Kroes, attended all Bilderberg meetings from 2006 onward- and since 2011 is the European commissioner for the digital agenda. Kroes, who is right up there with Henry Kissinger and David Rockefeller, is now handing over some of the responsibilities to a new generation of technocrats. Not very surprising then that Van Orange- the grandson of Bilderberg founder Bernhard- has recently been appointed by Kroes to head up her commission cabinet. 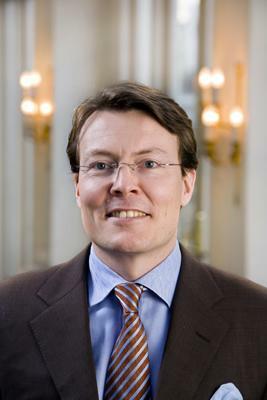 Constantijn’s speciality in his days with the RAND Corporation ranged from several technical reports on web 2.0 to RFID technology and other matters concerning “global governance” and electronics. In 2008 Constantijn was promoted to head the Brussels RAND office, expanding his influence even more. In 2009 Constantijn published his “discussion paper on critical issues” under the RAND-umbrella titled The Future of the Internet Economy. In it, he is quite uninhibited in his call for the emergence of an overall system of control to steer the course of events globally. “Though a sectoral, geographic and multi-layered patchwork is likely, a scenario with a more unified system is not impossible either. There are significant benefits for citizens, governments and commercial operators to have a more standardised system that would support a large range of eGovernment services and functions. One system would eliminate the need for multiple cards, would increase the possibility for interconnecting systems”, and the list goes on. “Focusing on Twitter, we used LIWC as a means of tapping into Iranian public opinion and mood during the tumultuous months following the highly controversial 2009 presidential election”, the report states. “We could also extend the current research by looking across more than one country at a time to gauge the sentiments that social media users in each country express on topics of interest to them all”, the report continues. The merging of Bilderberg’s post WW2-style corporate complex with technocratic giants will now accelerate an agenda that has been long in the making. By Benito Mussolini’s definition of fascism, that’s what it is. “Fascism”, Mussolini wrote, “should more appropriately be called Corporatism because it is a merger of state and corporate power.” Already in the works for decades this construct, or governance structure- merging big government with big corporations- is now taking a decisive digital leap with Bilderberg 2.0 which, by Mussolini’s definition, equals a new and enhanced version of the same old fascism.